The first ever documented match of Rollersoccer appeared in a January 1882 edition of the Derby Daily Telegraph. The first illustration appeared in the Illustrated London News around 1904. Then in 1934 a group of rollergirls played in Forest Gate Roller skating rink. Amazingly, there is video footage of this momentous occassion. Thank you Pathe! 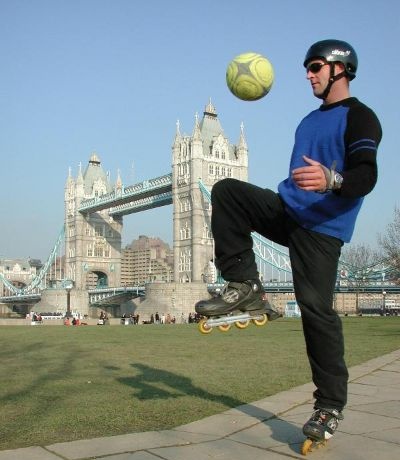 Fast forward to 2003 and London was once again the hub of the Rollersoccer action. The first ever World Cup was organised by Citiskate. Teams included Switzerland, Germany, Holland and even the U.S.A. England were trounced 10-1 in their opening match. In the 2003 final Holland obliterated the Germans to become the first ever RSWC champions. A year later the world cup returned to London where Germany avenged their loss by beating the Dutch. London skating company Zebra Skate now include rollersoccer technique in their weekly sessions ensuring Rollersoccer finds a whole new generation. Rollersoccer is great fun and ideal for intermediate+ level skaters. You can hone your inline skating skills, specifically your starting, stopping, turning and even backwards skating. It's also a great way to work on your cardio fitness which can be useful for the London Friday Night Skate ( FNS ) and Sunday Roller Stroll events. Since 2005 we have been running weekly practise sessions and in 2015 we celebrate A Decade of Rollersoccer. We are open to new members both male and female, quad and inline. The atmosphere is very accepting to new members.